We understand that, at times, you like to draft your posts and then revisit them later. This practice will help you avoid errors. Also, you might find a nice piece of content and wish to save it for later. Hence, SocialPilot provides you with an option to save posts as drafts. Click on 'Posts' -> Create Post. Create a post in the text box provided. Click on the 'Save As Draft' button which is beside the 'Add to Queue' button. Now, your saved post will appear in 'Drafts'. You can manage all your Draft posts in the 'Drafts' tab. Click on 'Posts' -> Create Posts. Click on the 'Drafts' tab beside the 'Create Post' tab. You'll see a list of all of your saved posts. You can edit/schedule the draft by clicking on the pen icon. When you click on the icon, a pop-up will open where you can edit the content and then, select the account from which you want to publish the post. Click on the 'Add to Queue' button or other scheduling options from the drop-down to schedule your saved post. If you wish to delete a draft, find it in the 'Drafts' tab and click on the trash can icon. You can also delete drafts together by selecting the checkboxes on the left and then, clicking on the 'Delete' button. Say you are browsing through the curated content list or feed. You find a nice post but you don't feel like publishing or scheduling it. Don't worry! Click on 'Content & Feed' from the side panel. Now click on the 'Add to Queue' button for the post you wish to save. Select the 'Edit Post' option from the drop-down. Now as you click on the 'Edit Post' option a 'Create Post' pop-up will appear where you can edit the content if you want. 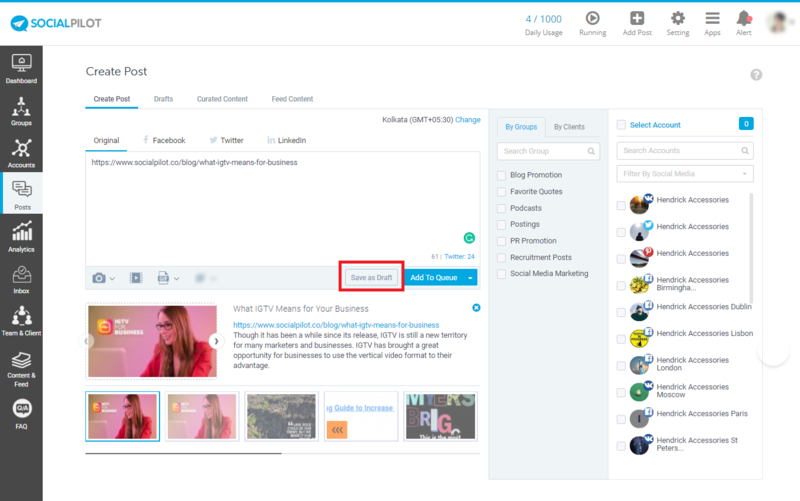 Click on 'Save as Draft' button beside the 'Add to Queue' button at the bottom of the text box and your Feed/Curated Content post will be saved as a draft. Save posts as drafts with SocialPilot - so you don't feel forced to schedule or share something that you aren't sure about.